Just a quick post to let anyone who reads this blog about the launch of Concrete Operational. Anyone is welcome, entry is free, there will be amazing music, incredible art, readings from the novel and the screening of the official Concrete Operational trailer. Map available here and there is a Facebook event where you can sign up officially. Also, I have some digital embeds for you, using the Issuu service, which is actually pretty cool, I can give you the first stage of the novel (160 pages) and the artwork for the theme of Jealousy. 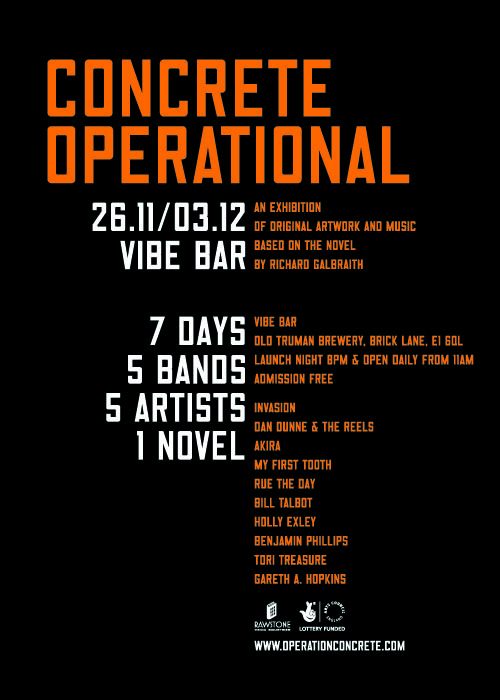 Download Concrete Operational - The Novel - Stage 1 by Richard Galbraith as a PDF. Buy Concrete Operational - The Novel from amazon. Download Concrete Operational - The Art Book - Jealousy by Holly Exley as a PDF. Buy Concrete Operational - The Art book from amazon. The album will be on sale soon, but as a sneak preview. Download Concrete Operational - The Album - Jealousy 'Hey Hey My Head' by Dan Dunne & The Reels as an MP3. Tagged as collaborative media, conrete operational, dan dunne & the reels, holly exley, independent publishing, novel writing, operation concrete, ricgalbraith, Richard Galbraith, self publishing, Writing.